This watch has cool and personalized appearance, which brings you a different charm. Special and eye-catching appearance and three time zones design. 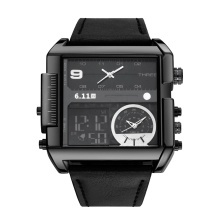 Alloy watch case makes the watch more practical and wearable. Leather watch band can provide you comfortable wearing feeling. Perfect for all kind of casual, indoor and outdoor activities. Great gift for your lover, families and friends as birthday, Father&apos;s Day, Graduation, Christmas present.